Do you remember your dad telling you that you “get what you pay for”? That wise old adage rings true because, well…most of the time, it is true. What is value? We believe it’s what someone is willing to pay or offer for something that solves a problem for them. That’s exactly what the founders of Bellroy set out to do when they started the company. What problem? Helping people like you and me to slim down their wallet without having to sacrifice function. It’s as simple as that. But as you’ll see, the process that goes into crafting these beautiful pieces of “carry art” isn’t quite as simple. We’ll look below at three areas areas of craftsmanship that Bellroy pours into every piece they manufacture. 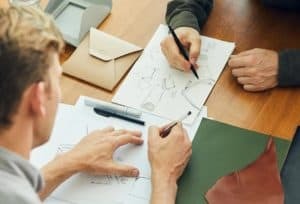 Fifteen or so years ago a group of friends (who also happen to be designers) sat around together discussing and designing how to make the perfect wallet. They looked at things like eliminating unnecessary layers in the wallet, as well as better functionality and positioning for your cards. This made them easier to carry and actually use when you need them (but not in the way when you don’t). In 2010, their efforts brought forth the Note Sleeve – their first slim wallet. Fast forward eight more years and they’ve come a long way since their humble beginnings. They employ an entire team of designers that are constantly pushing the limits to innovate the way that we carry. You can’t have Bellroy without their famous, vegetable tanned leather. It’s affects design, ensures quality and is environmentally sustainable. From a functionality standpoint, they use some of the thinnest leather we’ve seen. The thought behind it is this…what’s the point of designing the perfect wallet with minimal layers, if the layers you do have are super thick? No need to worry about that here. They have always used extremely high quality top-grain leathers. We’ve seen some confusion online as to whether they use top-grain vs full-grain and they definitely use “top grain”. Both leather grains are of the same quality, but the finish out is different. Full grain is leather in its rawest form, so to speak. They maintain the entire structure without any buffing. Top-grain, on the other hand, buffs out the leather nicely to create a smooth finish. If you’ve ever felt a Bellroy in person, that’s one thing you’d notice – how smooth the leather is. Bellroy cares about the environment and it’s sustainability. They are committed to only working with tanneries that adhere to gold-standard LWG (Leather Working Group) environmental protocols. These are an organized set of guidelines and standards that leather tanners follow to protect the environment from harsh chemicals that other tanneries might use. Even more so, Bellroy is a certified B Corp company – this is a group of companies committed to using their company to effect change in a positive way both socially and environmentally. Super strong stitching, quality wearing leathers and sturdy hardware. No uses of dangerous chemicals, heavy metals and others toxins known to cause harm. They design their products with the end in mind. All materials are easily recyclable. Reduce waste and energy consumption. They are always looking to align themselves with experts, making sure they’re doing all they can. Bellroy is constantly coming up with new ideas for ways to carry. And while they are always releasing new wallet (or improvement on old ones), they don’t stop there. Bellroy now offers bags, backpacks, multi-purpose pouches, portfolios (folios) and tech carry for tablets, phones, etc… Their end goal? The make the way you carry truly better. Making things slimmer, creating innovative functionality and using materials that last, the sky truly is the limit with this little carry company out of Australia. Or is it? The Best Checkbook Wallets Online…Period.